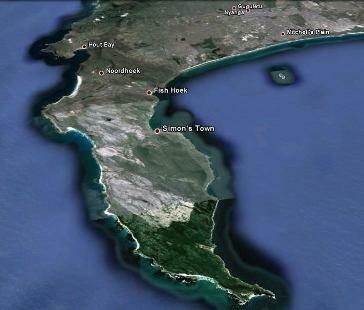 This is my first post to this new resource for the Cape Peninsula and I would like to take a few moments to explain to you what this site is all about. I love living in this area, and actually start to feel homesick if I spend too much time on the other side of the mountain: and I have every right to feel that way since I chose this area to live in, having not being born anywhere near here. In fact, I am a long way away from my birthplace, a small mining town in West Yorkshire, England; and it has been a meandering journey to arrive here. I have been around the world four times and seen a lot of the beautiful parts of the earth, and I still chose to live here. Most of my friends and family thought I was mad, because all they see of South Africa are news stories about crime, yet I saw through all that nonsense and took the plunge. I was on a flying visit to Cape Town in 2003, my partner and I were working on the Queen Elizabeth 2 at the time and we called in for 3 days at the end of the world cruise. By sheer look I wangled myself some time off (highly unusual on a cruise ship), hired a car and drove down south. My first view of Fish Hoek was from Ou Kapse Wag: it was a beautiful sunny day in April and I was smitten- it was stunning. The mountains, the sea, the sandy beaches; I immediately knew I was home. My next trip down was with my partner, Dustin (who is a Durbanite, but we can’t hold that against her), and she was as taken as I was. Unfortunately we had to set sail the next day for dreary old Blighty, but we spent the next few months as manically searching estate agent’s websites for properties in the area. Luckily the ships schedule was in our favor and we were not long in returning to beautiful Cape Town, and this time we were ready, hitting the ground running. We pulled all our favors and managed to get some valuable time off, arranged to meet with some estate agents and viewed houses for two days, faxing off an offer to buy from the ship as it pulled out of the harbor. By the time we reached the canary Isle’s (via St. Helena and Dakar) the offer was accepted; several weeks later we owned the house. There then followed a protracted period of visa applications for me, then in 2006 we actually moved here for good, and haven’t regretted a second of it. Now that I have had a chance to experience the area I have to say that it is unique: what a mix of cultures and mindsets! And now I am going to add my own point of view to the mix, and hopefully provide a platform to discuss the issues that we all face together. The Cape Point Chronicle is not a local newspaper and I am not a news reporter, I haven’t the time or the inclination to go tearing around being first on the scene: we have two excellent newspapers which do that very well. This is more an editorial on what is happening around us, and I make no apologies for the fact that it will mainly be my point of view. However, I love debate and hope that my posts will allow for as many points of views to be expressed as possible, so that we can all see local relevant issues from as many perspectives as possible. I am going to have fun doing this, and I hope that you get value out of reading it, and I look forward to receiving all your comments. Also, if there is a particular topic that is close to your heart, then please feel free to send me an email and if I think that it is appropriate to the site then I will post it for you. I also intend for the site to be a local resource, and it is my wish to use it to promote local events, charities and sporting clubs. If you are organizing anything in the area then let me know well ahead of time and I will give it a plug in a post and put it on the events page. I am a self confessed sports nut and am especially keen on promoting sport to children: if you run a sports club, or involved in anyway then keep me up to date with your fixtures, training sessions, meetings and results. One last thing, in order to receive content when it is at its freshest, please sign up to be sent the Cape Point Chronicle newsletter (see the opt in box on the right of the page, right where the ugly guy is smiling). I hope that this goes some way to explaining who I am and what I am trying to achieve with Cape Point Chronicle, but if you have any questions whatsoever then please drop me a line at russell@Capepointchronicle.co.za. Many thanks for your time in reading this post and I look forward to your continued support. This entry was posted in General information and tagged Cape Point Chronicle, cape town, constantia, fish hoek, hout bay, kommetjie, life in the far south, muizenberg, scarborough, Simon's town. Bookmark the permalink. Love the stories. Makes me home sick! Keep on writing….